One of the most popular young players in the game is now a Topps exclusive. The trading card company recently announced that they reached an exclusive agreement with Carlos Correa of the Houston Astros. The young player already has tremendous potential and considerable interest in the hobby and this deal makes Topps the sole place to find his autographed cards and memorabilia. Carlos Correa has emerged as one of the brightest young talents in the MLB following his major league call-up in June of 2015. The Puerto Rican shortstop posted strong numbers in his first season with a .273 batting average and 17 home runs in his first 77 games. His rookie card options are limited for now, but he has plenty of prospect cards and more rookie cards are on the way. This includes a Carlos Correa rookie card and autographs in 2015 Bowman Chrome Baseball. However, Topps has confirmed his signed cards will not be available in 2015 Topps Five Star. 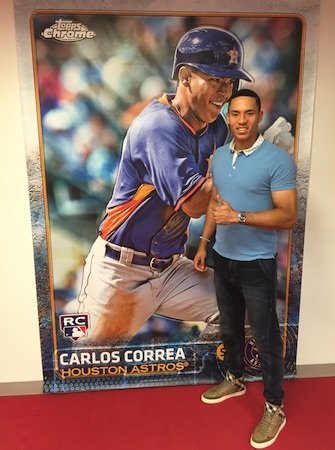 Via a press release, Correa said, "I'm thrilled to join the Topps family. I can't be happier about partnering with a company like Topps for my first major deal as a big leaguer." Although the specific terms of the deal were not revealed, Topps disclosed that the "seven-figure deal is for multiple years." It will also includes signed jerseys, baseballs, bats and art, a first for Topps. However, this is not the first young star in their stable as Topps previously reached exclusive agreements with both Mike Trout and Bryce Harper. I’m sure that this is a stupid question, but does this mean Correa can’t do show signings? Dan � The show would have to go through Topps to make that happen. Panini also has exclusive autograph card and memorabilia deals with several NFL/NBA players and the public signings those players do are usually organized directly by Panini. However, Steiner exclusives do regularly appear at regional shows.